Delivery - How long, how much! Amazing! I got 10 packs of personalised stickers delivered in less than 24 hours! 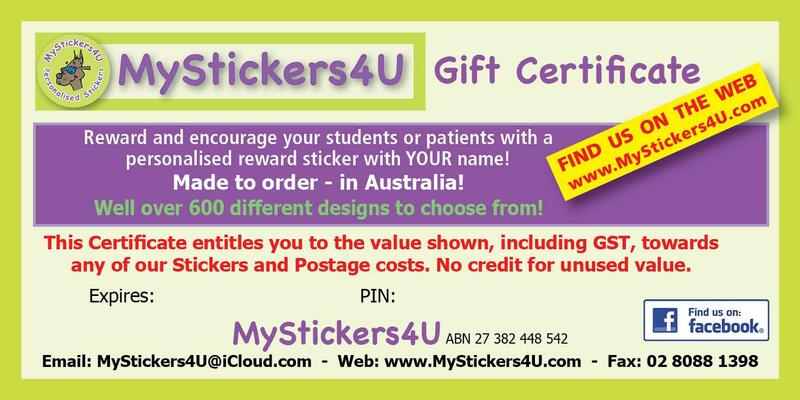 Reward and encourage your students or patients with a personalised reward sticker with YOUR name! Made to order - in Australia! Well over 600 different designs to choose from! GST, towards any of our Stickers and Postage costs. when redeemed as no Credit can be given for unused value. © 2007 MyStickers4U - www.MyStickers4U.com - www.facebook.com/MyStickers4U - MyStickers4U@iCloud.com. All rights reserved.